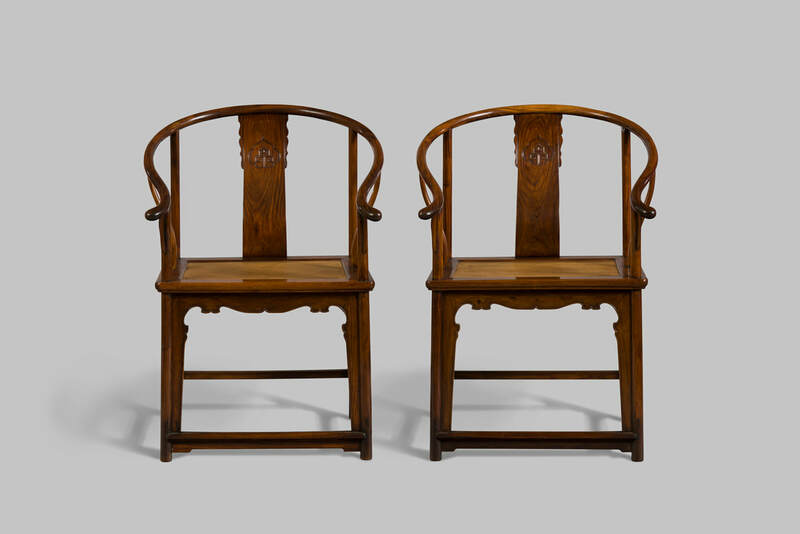 Pair of huanghuali horseshoe armchairs. 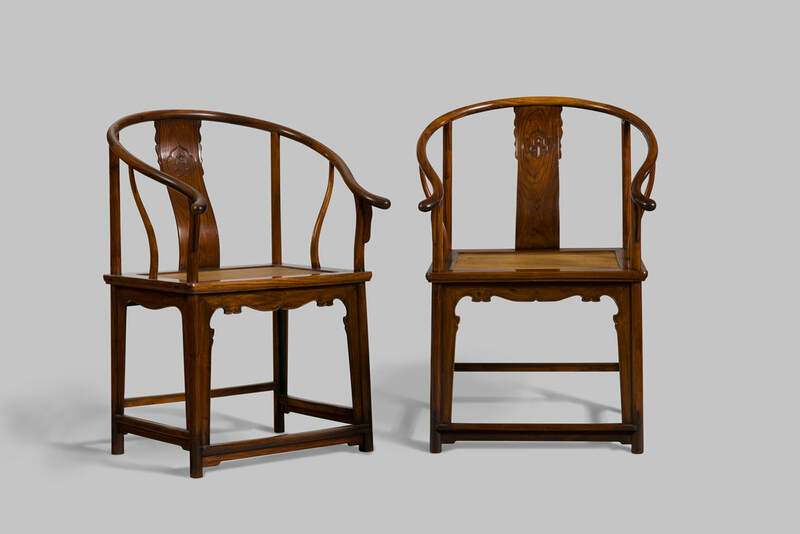 Late Ming–early Qing dynasty, 17th century. 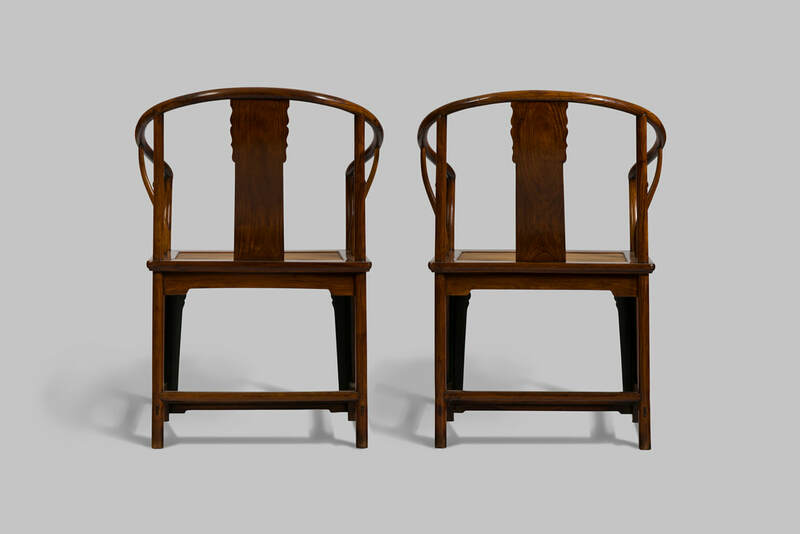 A pair of huanghuali horseshoe armchairs with five-part pressure-pin overlapping scarf joints supported on circular-section rear posts that continue through the seat frame to form the back legs. 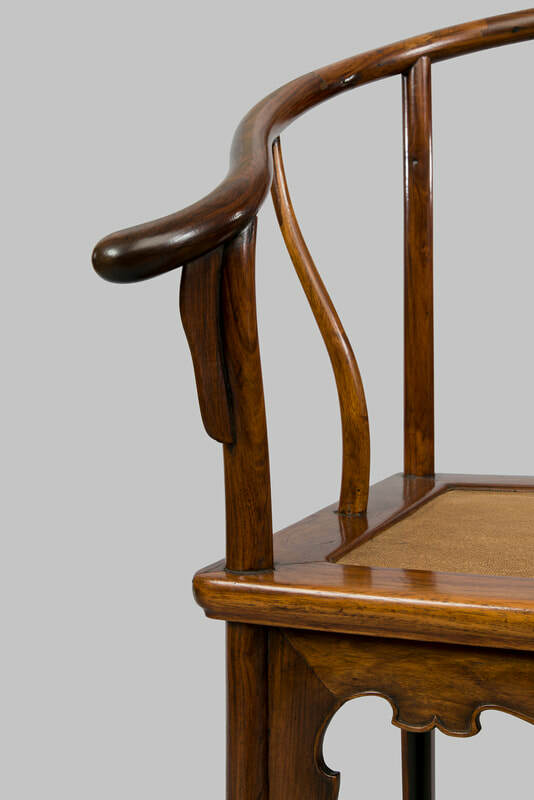 The front legs are of similar construction, circular in section above and beneath the seat rail with a square shoulder to support the seat frame, and are tenoned into the underside of the arm with small spandrels beneath the out-curving ‘handles’. 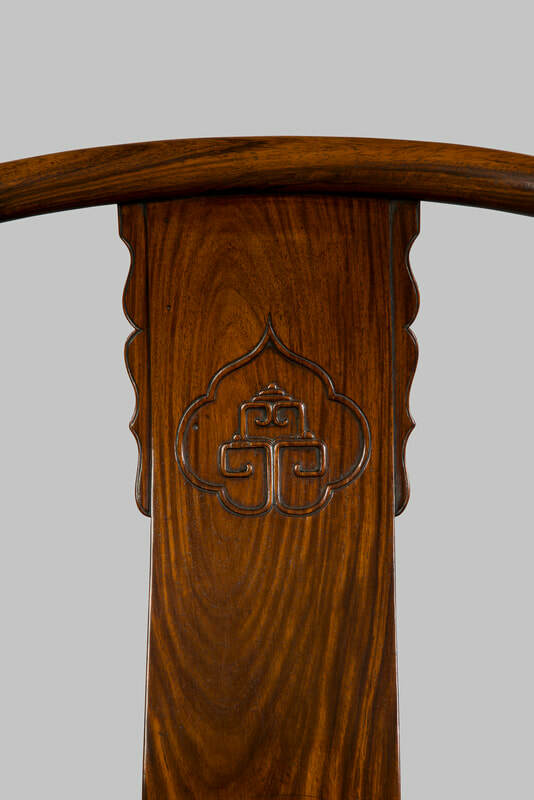 The S-curved splat with a central roundel flanked by scrolling brackets with raised beaded edges. There are S-shaped tapering braces between the arm and the side rails of the seat frame. The seat is of typical mitred, mortice and tenon construction, converted to a hard-matting seat. 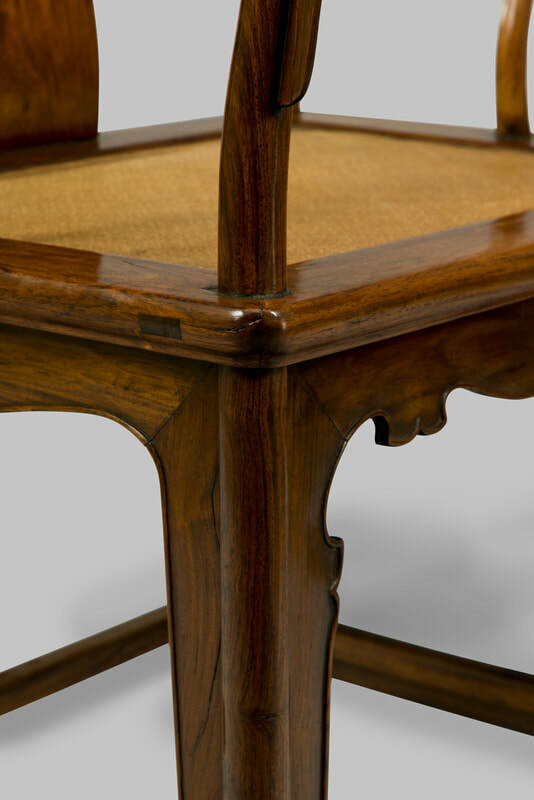 The tenons are exposed in the short rails of the seat frame that is finished with a plain cushion moulding with a square shoulder below. 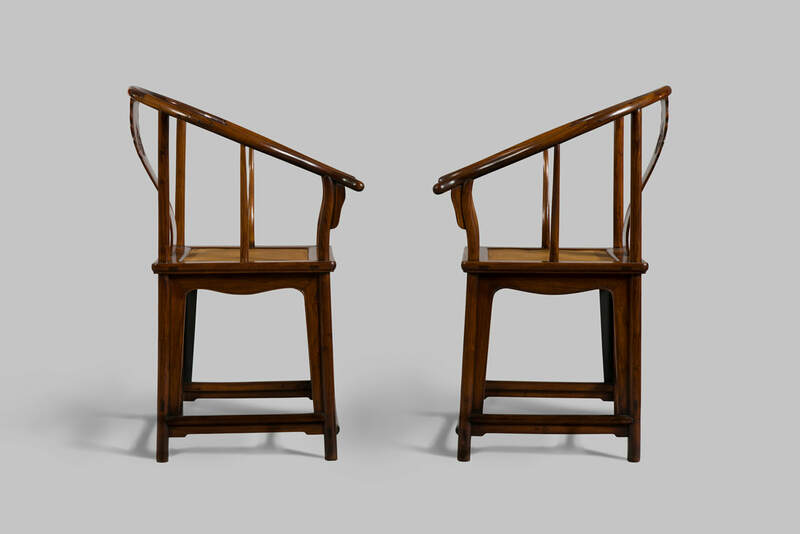 The square-section stretchers between the legs have a gently rounded outer face and are arranged in ascending heights from the foot rest. 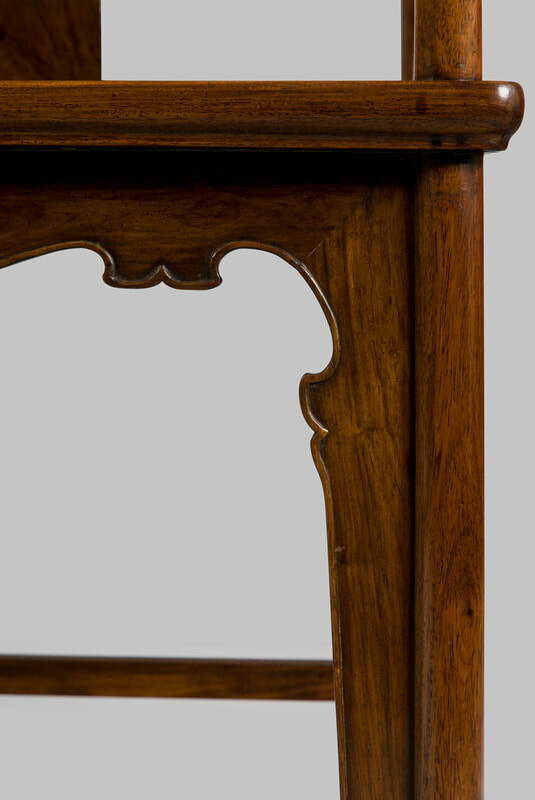 The side stretchers, back stretcher and foot rest have exposed tenons. The mitred front apron is carved with a moulded edge on the upper section and the uprights and there are traces of intertwined tendrils that have subsequently been removed from the centre. The mitred side aprons are finished with an incised line reflecting the raised bead on the front aprons. The rear apron is constructed from one piece with short shaped ears, as is the apron beneath the foot rail. Late Ming–early Qing dynasty, 17th century.